This recipe is my entry to the event "Shhh!!! Cooking Secretly" challenge conducted by Mayuri Patel of Mayuri's Jikoni. For the month of January, I have paired with Vidya Narayan of " Masala chilli " and the ingredients given by her are coconut and cumin. We planned to try Goan cuisine with the given ingredients. Seafood, coconut, spices and rice are main ingredients of this cuisine. 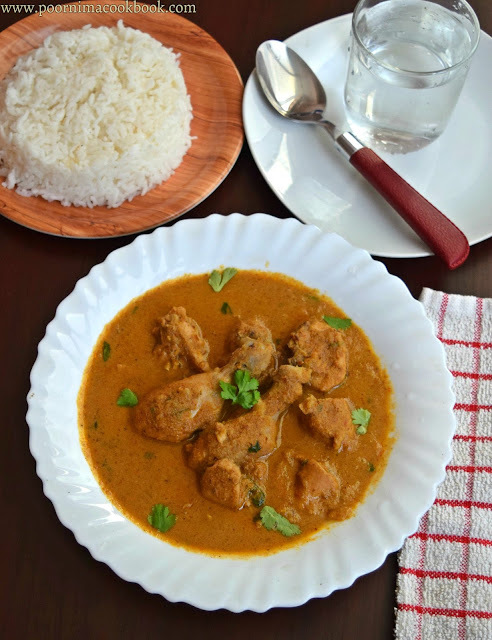 After I explored many recipes, I want to this try this exotic chicken xacuti recipe from the vast goan cuisine. It was a lip smacking and aromatic gravy. 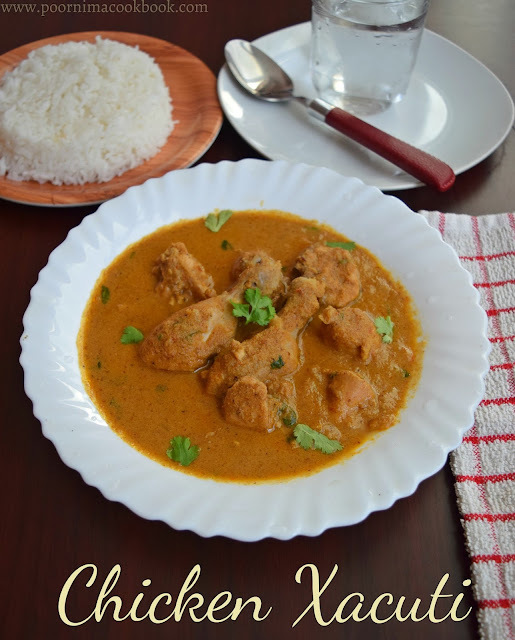 Chicken Xacuti ( also known as chacuti in Portuguese) is one of the popular dish from Goan cuisine. This dish has wonderful blend of spices, red chilli and coconut. Instead of chicken, you can try this using vegetables,prawn or mutton too. 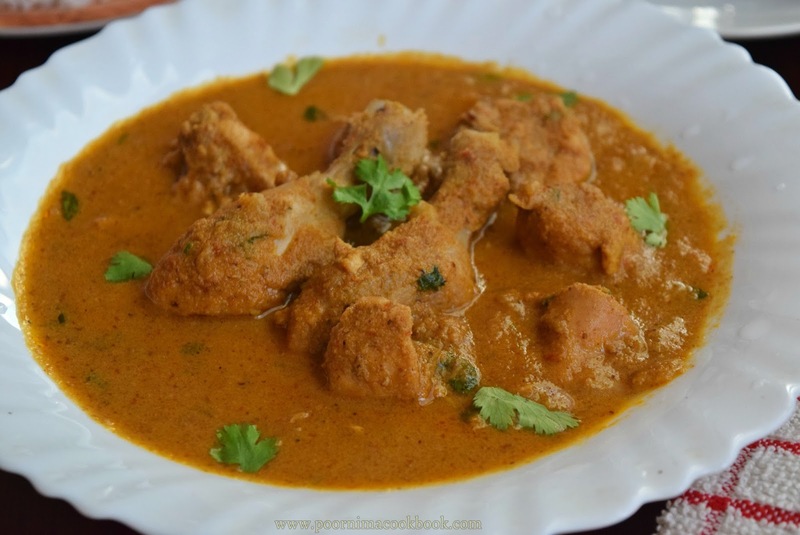 Try and enjoy this goan delicacy with your family members! Clean and wash the chicken; cut into pieces. Marinate with salt and turmeric powder; keep aside. Heat a pan, add the ingredients from coriander seeds to star anise. Start roasting in medium flame. Once the aroma started to come. Add grated coconut and saute till it reaches golden brown in colour. Allow to cool; add ginger and garlic to the coconut mixture. Grind it into fine paste by using water. Heat oil in a wide pan, saute onion till it becomes translucent. Add the marinated chicken, saute for 2 to 3 minute. After that add the grounded spice coconut mixture. Saute well till masala coats the chicken. Add 2 glass of water to the chicken and close the pan with the lid; allow to cook. Once the chicken is cooked , add tamarind paste. Mix well and reduce the flame; continue to cook for another 5 to 10 minute till oil comes out. Switch of the flame and garnish with coriander leaves. Serve hot along with rice and relish! I love this spicy chicken dish from Goa.. I have made it once. Gravy colour has really come out well. Great platter Poornima and excellent use of the secret ingredients. Cheers! The chicken looks very juicy and delectable Poornima!Wow post! Rich Chicken Curry Deliciously made with Xacuit masala. the flavours from the masala is awesome..
Fabulous and tempting curry! The colour of gravy itself so appetizing! Oh my. YUM YUM YUM. Your recipe had me checking it out just due to the name! It sounds wonderful! Thank you for sharing! AN excellent way to use the secret ingredients. I love the colour of the gravy and definitely want to try out the famous xacuti masala to make a veggie dish. Oh my! This is one tasty looking chicken! Ive not tasted xacuti earlier but your recipe makes me want to organise the masala and get going at the earliest! I have tried a vegetarian version of this classic using mushrooms for this month challenge..your Chicken Xacuti looks simply irresistible !